Some people like to compose a picture where points of interest or significance are arranged to fall onto points one third in from the edge. To see this with our viewing aid or guide we want to add lines that fall a third of the way in from each side of the cut-out. Where they cross we have the 4 points that we are specifically interested in. We can use string, thin elastic bands or some other method to add these lines. In the card I was cutting out, I had a piece of card left after cutting off the two L shaped pieces and out of this had a cut out that was 1:1.5. The cut out measuring 12cm by 18cm. I added nicks on the outer edge, level with a third of the way along the cut-out, so in the 18cm cut-out this was lining up with a position 6cm and 12cm along, and along the 12cm side, 4cm and 8cm. 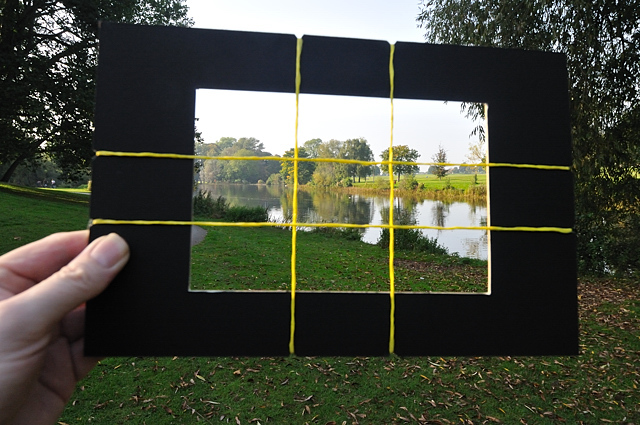 I didn't have any thin enough elastic bands, so decided instead to use some yellow string that I did have, pulling this straight and lining it up, by pulling it through the nicks, and then using cellotape to keep it in place. I could, if I wanted, make it more robust by dabbing a bit of superglue on each of the string cross over points and where the string goes through the nicks.